The Wild Spirit.....a short film about me! in Park City Utah......Karen is the owner there and she likes my work and thinks other people down there will too..... i'm hoping she's right!.....YAY!! with an artist talk as well (i'll share more on that later)......here are some pix of the display and paintings....some of the paintings left from this show may have a new place to go to be seen....more on that later maybe....!!! so, the 1st 2 pix are from the show...and it was a good show, very well attended...many talented glass artists, and quite a diverse array of glass art!! i think the show has mucho potential to grow and evolve into something quite cool.....the last pic is an image of a brand new bowl!! with long legged sassy chickens....i saw sooooo many chickens in bali, and i loved seeing them running all over.....truly Free Run chicks, which is kind of how i want to operate in the world, especially in my creative practice.....and that is the only kind of eggs i wanna eat!! !....even saw a chicken running through an art museum....really, ya gotta love that.....also, soon to come, well they are already created, just have to post them so you can see them too....free range chicken mixed media pieces!!!! i am really likin' the whole chicken thing, i have had chickens in my glass before ....aaaaaand i will have some dogs coming into the scene too!!! bow wow! ok, well i'm back....like i said, with more skulls.....and just a little note for all you NON skull lovers, i have many other things on the go in my studio as well.....like bees!!!! ya know the buzzing bumbling humble little bee's that support our life on this planet??? and of course flowers....cause bees need 'em, and they are beautiful design imagery.......for now though, back to the skulls.....the 1st image is a pic i took TODAY, just outside my studio door.....with the new skull hangy things....they are definitely "el dia del muerte" mexican type skulls....i like the daisy eyes and i really like the idea of celebrating with your fave people who have moved on to other realms....so, i find these skulls quite happy and feel good, and as they slowly spin around the movement is quite entrancing..
the 2nd image is a shot from my journal/sketchbook.....this i did while traveling in borneo, malaysia.....and in that country the skulls are a whole different thing...although still involved in a belief system.....the tribal people were (many many many years ago) traditionally headhunters....yah, i said headhunters!!!! and the trophies from inter-tribal warfare were oftentimes skulls of the enemy.....and, they believed that the skulls had magical powers, the fresher they were the more powerful the magic!!!!! wild hey?? check back again , lots more to come....like cremation ceremonies in bali!! another celebration of death, to help the spirits move on to the new realm.......quite spectacular......embellishments galore!!! hello. my name is tammy hudgeon. 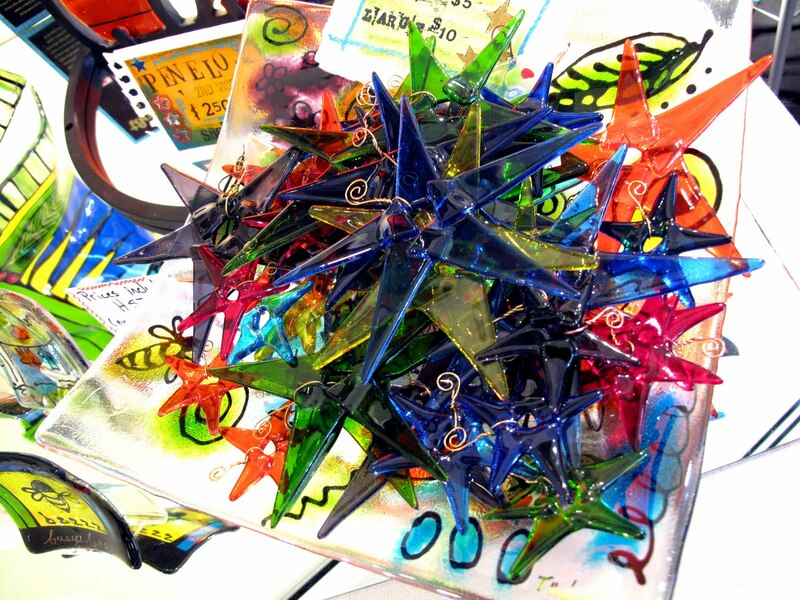 i am a glass and mixed media artist.